Non-life aggregate net profit was BGN 91.05 million (EUR 46.56 million) vs. BGN 63.91 million (EUR 32.68 million) in 2017 (audited data). Of overall 25 non-life insurers, the largest profits were reported by ALLIANZ Bulgaria (EUR 7.72 million), DZI General Insurance (EUR 7.14 million) and BULSTRAD VIG (EUR 5.12 million), while the largest loss was reported by DallBogg Zhivot I zdrave (EUR -656 thousand). On the life insurance side, the Bulgarian insurance market closed the year with an aggregated profit after tax amounting to BGN 27.06 million (EUR 13.84 million) vs. BGN 27.36 million (EUR 13.98 million) a year before. Of 12 active life insurers, only one company ended the year "in red" (EUROINS Life Insurance, with a net loss of EUR -0.21 million), while the top 3 most profitable life insurers were DZI Life Insurance (EUR 4.64 million), UBB-Life (EUR 3.26 million) and BULSTRAD Life VIG (EUR 1.77 million). In terms of GWP, the life insurance market totaled BGN 444.47 million (EUR 227.25 million), or 3.69% more y-o-y, due the increase of unit-linked segment by more than 10%, while the non-life insurance sector generated 82.41% of the total insurance market, the equivalent of BGN 2.08 billion (EUR 1.06 billion), up by 19.10% y-o-y. BULSTRAD Life VIG, ALLIANZ Bulgaria Life and UNIQA Life were the Top 3 life insurance market leaders, with an aggregate market share of 61.20% of total life GWP. LEV INS , DZI and BULSTRAD VIG were the Top 3 non-life insurers in the country, accounting for 35.79% of this segment. 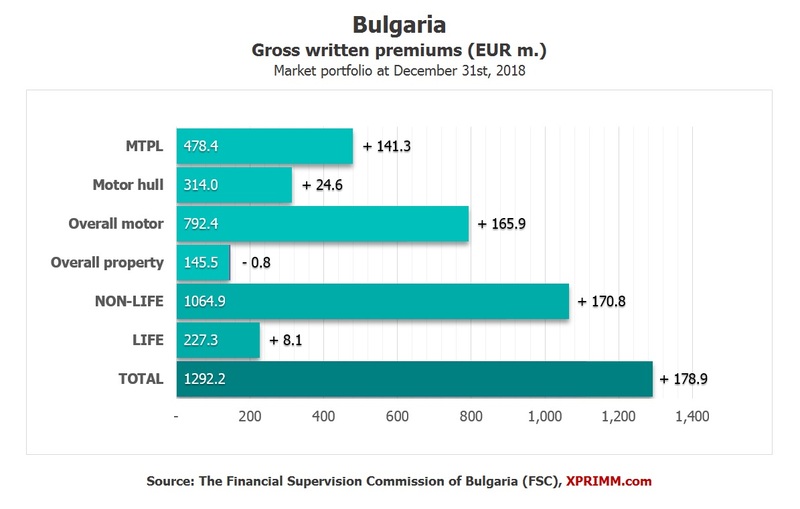 Access www.xprimm.com and download the FY2018 Bulgarian insurance market statistics (in EUR and BGN).